Congratulations to Young’s Restaurant and The Wilderness Society for being two of 2019’s Green Globe Awardees! Young’s Restaurant family with ECOSS partner.Photo Credit: ECOSS. Presented by King County, the Green Globe Award recognizes outstanding leadership in environmental stewardship. It is the County’s highest honor for local environmental efforts. Young’s Restaurant is the first Seattle business to utilize King County’s RainWise rebate program. ECOSS facilitated the installation process by recruiting multicultural contractors, guiding them through the RainWise certification training and helping the Vietnamese and Chinese contractors and restaurant owners through the English-dominated process. The Wilderness Society and ECOSS partners. Photo Credit: Ned Ahrens / King County. The Wilderness Society partnered with ECOSS to conduct outreach around the Trailhead Direct public transit service within historically underserved communities of color. This affordable alternative to driving provides greater access to the natural beauty that the Pacific Northwest has to offer. With support form The Wilderness Society and King County Parks, ECOSS extended awareness of the service into the Bhutanese, Latinx, Korean and Khmer communities of the Greater Seattle area. Dow Constantine. Photo Credit: ECOSS. ECOSS received the Green Globe Award in 1999 for leadership in protecting water quality and in 2015 for leadership in environmental equity. Building on experience, ECOSS is proud to share its strengths and elevate others to be environmental and equity leaders. Congratulations again to Young’s Restaurant and The Wilderness Society. Read more about their work and ECOSS’ role in promoting outdoors access and environmental equity. The Pacific Northwest is heralded as a hiker’s paradise. According to a recent economic analysis, the average Washington state resident spends nearly a full two months recreating outdoors every year! Yet, some communities are still not able to enjoy these Pacific Northwest splendors. One of the greatest barriers is the lack of transportation access. To reach beyond urban centers, you need a car. At least, that was the case until recently. Trailhead Direct is an expanding program that leverages public transit to provide affordable, accessible transportation to the outdoors. Jointly led by King County Parks and King County Metro, Trailhead Direct offers direct routes between transit centers in Capitol Hill and Mt. Baker to trailheads at Mt. Si, Issaquah Alps and Mailbox Peak. Over the summer months, ECOSS staff will plan and lead groups on hikes via Trailhead Direct. Be on the lookout for opportunities to get involved! 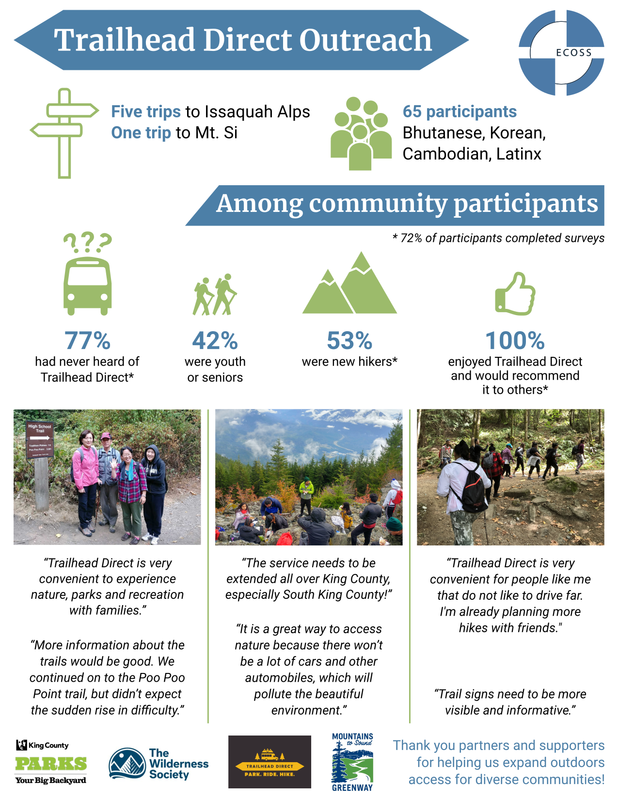 And thanks to the generous support of King County Parks and The Wilderness Society, ECOSS is excited to broaden the reach of Trailhead Direct to diverse communities. We specialize in multicultural outreach, using our staff’s ability to speak over a dozen languages. Through our New Arrivals Program, we connect immigrants and refugees with opportunities to engage with their environment. Trailhead Direct enables us to provide more transportation options and make outdoor recreation a more accessible and inclusive activity for all. Thank you to Mountains to Sound Greenway Trust for connecting us to this exciting program!